A couple years ago, someone at DC Comics had the good idea to bring back the one, true Supergirl, but since that time the company's struggled to decide what to do with her. Supergirl: Way of the World, by writer Kelley Puckett, has some entertaining moments, but continues to wallow in a meta-textual search for a real basis from which to write the character. Most readers might very well skip this trade and begin with writer Sterling Gates' run as part of Superman: New Krypton. Puckett pairs Supergirl here with Mitchell Shelley, DC's latest incarnation of Resurrection Man, and it's a team-up that works exceptionally well. 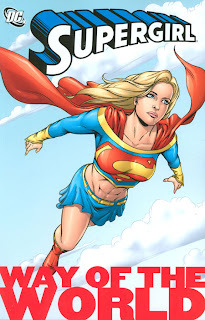 Shelley's hard-traveling sarcasm offers funny moments paralleled with Supergirl's headstrong determination to do the impossible and cure a boy's cancer; I believe fans of the Resurrection Man series will enjoy the continuity notes here, too. I was only surprised the story didn't acknowledge that Resurrection Man had a similar crossover with Peter David's previous incarnation of Supergirl, though DC may be trying at this point to sweep appearances of any Supergirl prior to this one under the rug. I've also appreciated Puckett's flair for the sudden and absurd in his two Supergirl volumes. In Way of the World, as in the prior volume Beyond Good and Evil, Puckett interrupts the story (sometimes in mid-conversation) to take the reader to a sci-fi future where events influence the current action. These cut-aways are purposefully jarring and serve to break up the mundanity of what's at times an all mope, no action story. Ultimately these parts add up to no more than Elseworlds Supergirl stories, but they're some of the best part of the storyline and demonstrate a depth to Puckett's writing that he's not able to show through most of the book. Readers that might've been freaked out by writer Joe Kelly's "good-girl-gone-bad" take on Supergirl will be comfortable here with Puckett's more traditional take; but unfortunately, this Supergirl is at times impossibly dull. Her quest to cure the boy's cancer seems naive both to her fellow heroes and the reader, and as such it's hard to be sympathetic with just how melodramatically sad Supergirl is afterward, letting alone that much of the aftermath is handled by fill-in writers and not by Puckett himself. Given the end of Puckett's tenure on Supergirl, as well as Supergirl's failure to save the boy she befriends, it's unlikely we'll see the involved characters again; it makes these two volumes of Supergirl tragically unimportant. Much of these first thirty issues of Supergirl have been spent on the character's angst and guilt -- first, over apparently being sent to Earth to kill Superman (later explained away) and here over the general death and destruction of Krypton, ad nauseam. This is a merry-go-round that the Supergirl title has been on for some time; with the end of Puckett's run and the beginning of Gates', hopefully the book will find a direction it can stick with. On Thursday, learn the unlikely connections between Birds of Prey and Death of the New Gods with our review of Birds of Prey: Club Kids. And coming soon, Batman: RIP and guest review month!